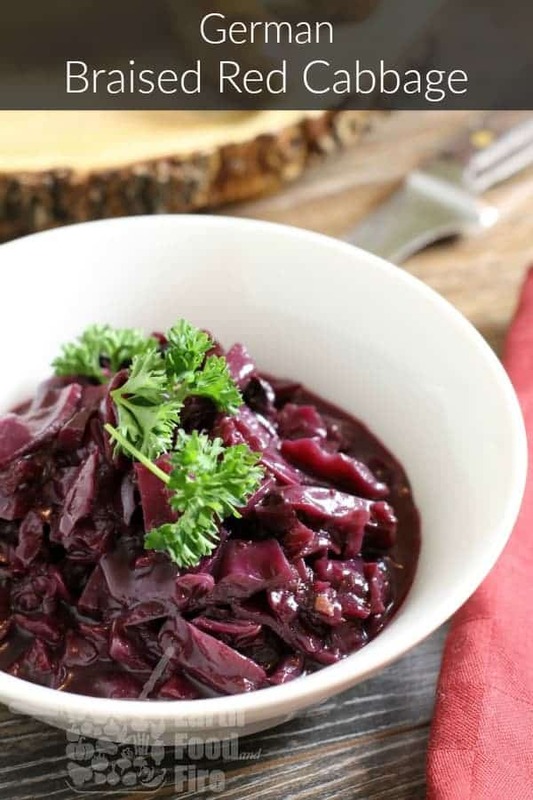 German braised red cabbage, also known as Rotkohl (in the North of Germany) or Blaukraut (in the South) pairs well with day to day dishes such as Pork Sausages, Beef Rouladen, or Schintzel, and is a staple side dish in many German homes. Braised red cabbage, is a traditional side dish served throughout the year, but is especially popular over the holiday season. During the Christmas season, this sweet and slightly sour dish is fantastic served alongside roasted meats and poultry such as duck, goose, and venison. Cabbage is consumed in a variety of ways in Germany. 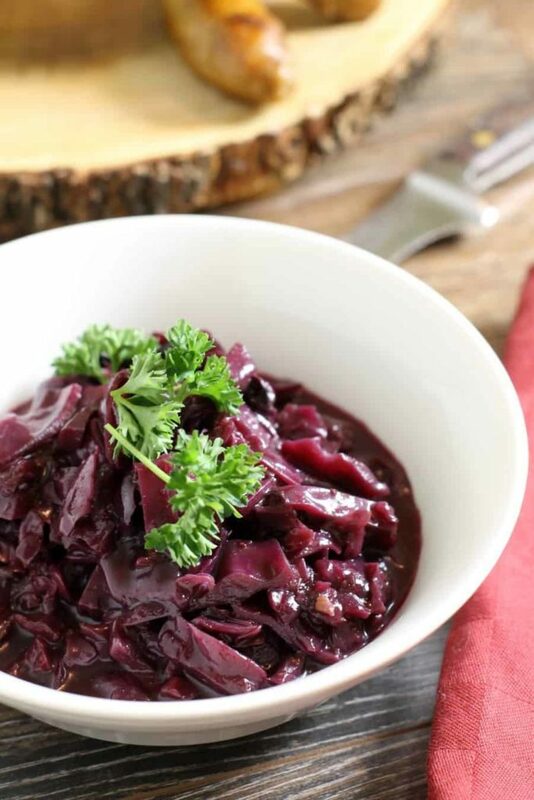 It’s eaten raw in coleslaws, pickled in condiments (such as German Sauerkraut,) and is often cooked, such as in this German braised red cabbage recipe. This traditional German recipe is an easy “set and forget” recipe that can be prepared with minimal time spent slaving in the kitchen. The recipe can also easily be altered. Where I use cloves, bay leaf, and blueberries to give the dish a slightly sweet and spiced holiday flavor, other spices and ingredients can easily be used to make the dish more savory. Red cabbage is full of healthy goodies. Chalk full of potassium, Vitamin C , K and boasting ten times the amount of Vitamin A then green cabbage, it is a great vegetable to incorporate into any healthy diet and meal plan. Since everyone seems to binge on sweets during the holidays, this is an easy way to incorporate something slightly healthy into your festive meal! Start by chopping the red cabbage into thin slices. The easiest way to achieve this is by peeling off one or two outer leaves if they are damaged to expose the clean and tightly formed vegetable beneath. 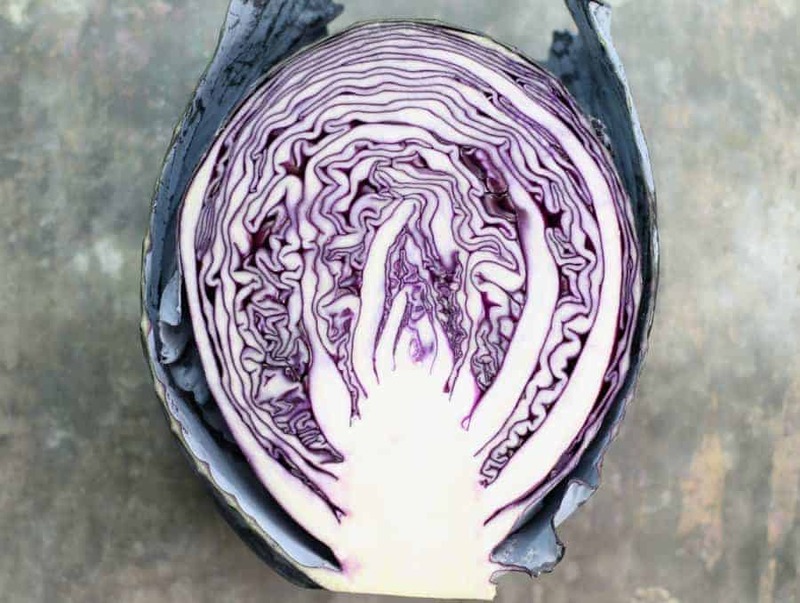 Cut the cabbage into quarters with a sharp chefs knife, and cut out the core as shown in the picture below. While the core is technically edible, it is tough with little flavor. Not ideal in this recipe! 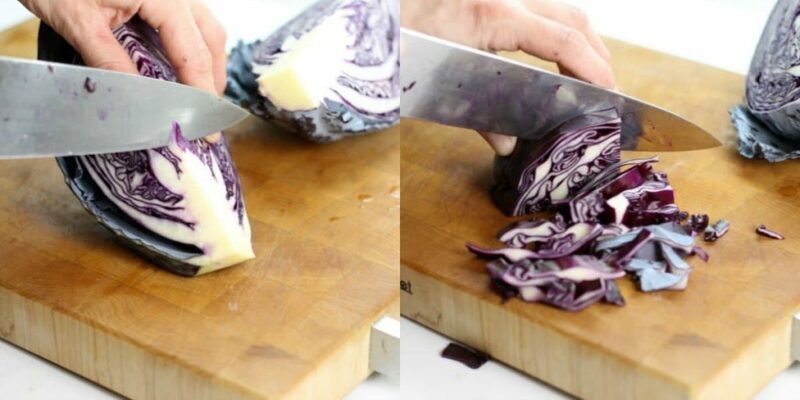 Once the red cabbage has been cored, continue by chopping the cabbage into small strips. After chopping the red cabbage, place it in a large bowl and give it a quick rinse. This removes any dirt or insects which may have been caught in the cabbage as it formed. Set the washed cabbage aside. Next Chop the onion into a medium or small dice size, (depending on how refined you want to go,) and lightly saute the onion in some oil or butter to soften it. Clarified butter is ideal for this as it has a high smoking point and won’t caramelize the onion as easily. You only want to cook the onion until it softens, not brown it. Add the chopped cabbage to the pot and cook for four or five minutes over a medium high heat. De-glaze the pot with red wine, and add the water or stock to the cabbage. Add the blueberry jam, clove, bay leaf, and salt to the pot, then reduce the heat to medium-low heat. Cover the pot with a tight fitting lid, and let the red cabbage braise, (essentially simmer), for one to two hours. It’s not necessary to fully submerge the cabbage with liquid as we will cover the pot as it braises locking in the moisture. Periodically, have a look in the pot and stir the braising red cabbage to make sure it is not sticking or burning to the bottom of the pot. 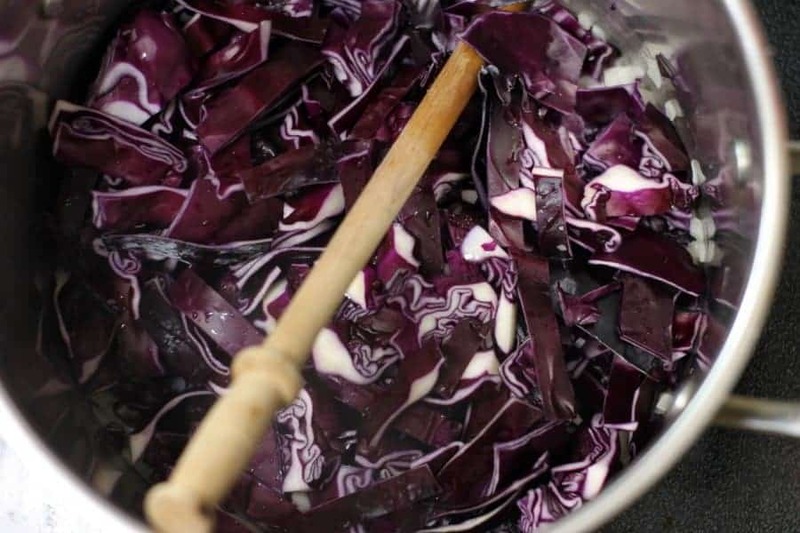 Towards the end of the cooking time, the liquid will have reduced, and as long as the cabbage is soft and tender, you can either serve the braised red cabbage immediately, or cool it and then re-heat at your leisure. 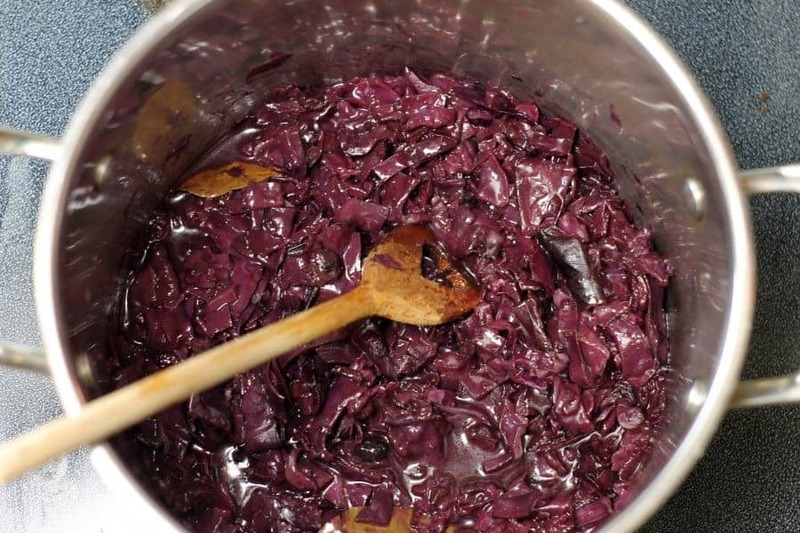 My mother always said, the Rotkohl gets better overnight as it marinates in its juices. So feel free to make this side dish the day before you are having guests over for supper! If the juice in the pot is still very thin after braising for almost two hours, you have a few options to try and thicken it up. You could simply keep cooking the red cabbage for five to ten minutes without the lid to cook out some of the liquid. The sugar in the jam, (and if you used real chicken stock, the gelatin) will help naturally thicken and glaze the vegetable. Alternatively you could make a slurry with flour or corn/potato starch and use that to thicken the liquid. Be careful not to use to much thickener, the liquid should be just thick enough to barely coat a spoon! 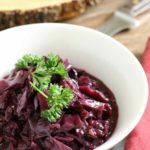 A popular side dish throughout the holiday season, German braised red cabbage (also called Rotkohl or Blaukraut) makes a delicious side dish to roasted meats and poultry..
1 cup blueberry jam or preserve I used homemade! Clean and wash the red cabbage. Then remove the core, and cut the cabbage into bite sized pieces. Chop the onion, and saute it in some butter or oil over medium heat until it softens, taking care not to brown or caramelize it. Add the washed and cut cabbage to the pot, and continue to cook for another 5 minutes, making sure the onion and cabbage are well mixed. De-glaze the pot with the red wine, and then add the blueberries, ground clove, bay leaf, and salt to the pot. Cover the pot and turn the heat down to medium low. Braise the red cabbage for one and a half to two hours. The braised red cabbage is finished when it is soft, tender, and the liquid has reduced enough to lightly glaze the vegetable. This sounds and looks delicious! Perfect for a Christmas dinner! This sounds amazing! I just ate some braised cabbage recently that had fennel and balsamic vinegar in it. I didn’t realize how much I actually liked red cabbage! Hahah I kind if had that realization a few weeks ago..hence this recipe! Thanks Markus. I’ve already made your recipe and it’s very very nice. Reminds me of my late Aunty Lorna’s cooking. Super good! I’ve also made it with my Anise Myrtle Cherry Jam it’s great. Thanks and Merry Christmas. I need to try this with your jam ASAP!! The cherry jam looks fantastic btw! Markus–This looks very appetizing, and I love the color. Thank you Renea! The color is quite sunning isn’t it! I promise it tastes just as good. 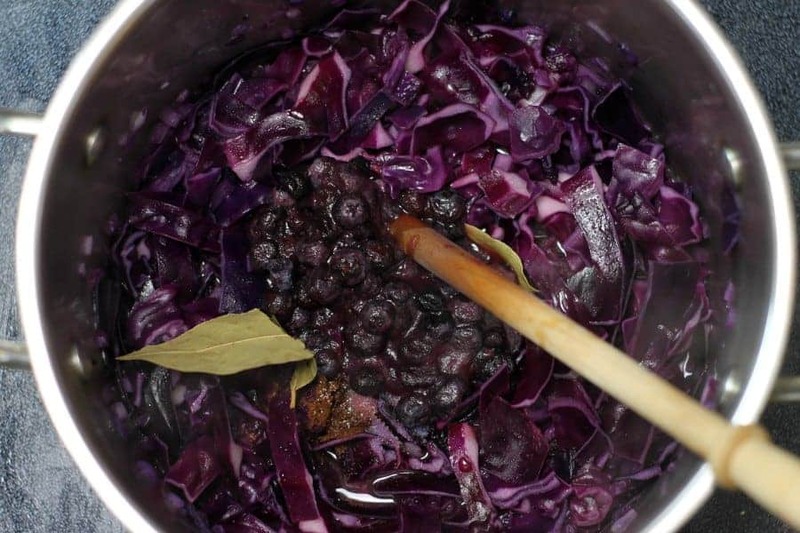 I make a similar red cabbage with apples and caraway (from a German friend’s recipe). But this one with blueberries and clove sounds so tasty and intriguing. A definite must try, thanks for sharing! Mhm…I feel like caraway is a very under utilized spice in North America haha.. I love it especially in bread, and cheese (gouda particularly). This looks amazing! I will certainly be trying this out soon! Be sure to take a picture and tag us on instagram! We’re having red cabbage tonight! We love it, and although we were going to have it with apples as we usually do (no bacon because I’m vegetarian), tonight we might try your wonderful recipe with blueberries and clove! Love it! I can see the apples and red cabbage working together just on their own as as well! Red cabbage was a vegetable I always hated as a child, but have grown quite fond of lately! 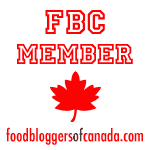 Cabbage is one of my favourite foods, oddly enough! This recipe looks fantastic, I would have never thought to add blueberries! The blueberries add just the right amount of sweetness! if you use frozen blueberries, consider adding a quarter cup of sugar to the pot! That sounds so delicious Markus. We have a German restaurant here in Paraguay and we really enjoy going there and having all those delicious sausages. I´m glad your recipe calls for blueberry jam and not fresh blueberries, as we don´t have the fresh ones. I´m going to give this recipe a try. Thanks for sharing! Glad to hear it Lizet! I’d love to hear how the recipe works out for you, take a picture and tag us on social media!